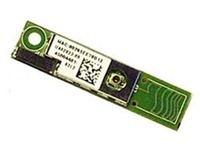 The Dell Wireless 375 Bluetooth Module is a new smaller version of a daughter card. The card connects to the system board using a cable. The card is smaller than the Dell Wireless 365 Bluetooth daughter card but provides the same reliability and the new Bluetooth 3.0 standard.